Hey, Planner Babes! Rochelle, here. The Happy Planner® has not only helped organize my personal life, but the amount of customization has been a game changer in my work life. By far my favorite way to plan at work is to make my own DAILY PLANNING PAGES using the CLASSIC - Colored Paper - Half Sheets and some stickers, of course. So grab your favorite Value Pack Stickers and your CLASSIC - Colored Paper - Half Sheets, and let’s plan out a busy day! For me, my go-to for FUNCTIONAL stickers is the Fill In Productivity - Value Pack Stickers. They’re not only totally FUNCTIONAL, but they have cute colors too, which I don’t know about you BUT it’s a must for keeping myself motivated on a busy day. I always start with the SCHEDULE portion of my DAILY PAGE. I usually have a few meetings or project/task due each day, so seeing those laid out first really helps me plan the rest of my day with priorities and general tasks that need to get done. The HOURLY sticker strips are amazing, which are included in the Fill In Productivity - Value Pack Stickers. Using these stickers allows you to quickly lay out your schedule. This will give you a great starting point for planning out your day. Once I have my schedule set, I write down my TOP PRIORITIES, the top three things that I absolutely must do by the end of the day. Next, I fill out a list of EMAILS that I have to send out that day, as well as fill out the main scheduled tasks for the FOLLOWING day. I prefer to see what I have coming up the next day in case there are any due dates or meetings that I need to prepare for ahead of time. For me, this method of DAILY PLANNING comes in handy for the days that turn out way busier than anticipated. Those days are strictly “pen only” DAILY PAGES! While stickers make everything a whole lot prettier, sometimes you've gotta be okay with a more FUNCTIONAL, and possibly "less pretty," DAILY PAGE in order to get all those to-dos out of your head and onto paper so you can start tackling that list. Even without stickers, I try to stick to my FOUR main sections. Once you find your preferred method of planning, CONSISTENCY is KEY. DAILY PLANNING on busy days at work has REALLY helped me stay focused and be productive. Not only do these PAGES help to keep me on task, but they’re super handy on those days when I don't want to carry my planner from meeting to meeting, or if I need to save space in my work bag. I have my whole schedule right on one page, and when I want, I can pop it right back into my planner! SO easy! I would love to hear how you plan out your busy days? Do you have any tips and tricks? Feeling inspired? 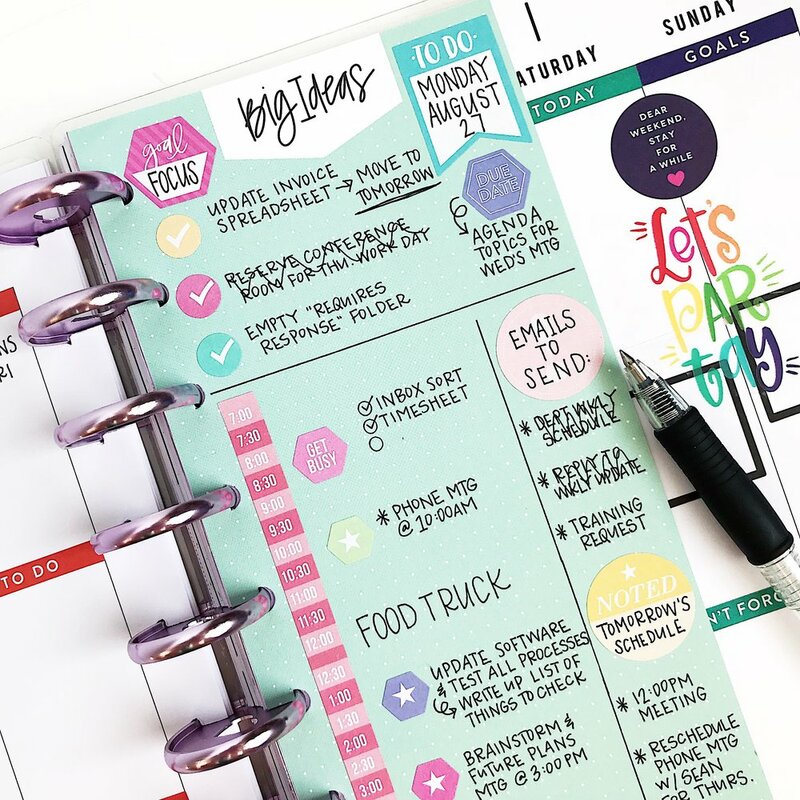 Head over to Instagram and give Rochelle (@plansbyrochelle) a FOLLOW to keep up with all her Happy Planner® creations!